Chinese braised oxtail dish, prepared in the Instant Pot a fantastic new tool in my kitchen. This appliance really has cut down the cooking time impressively compared to a Dutch oven on the stovetop and/or oven technique. Only slow-braising in the slow cooker could be an equal in flavour but definitely not a time-saver. 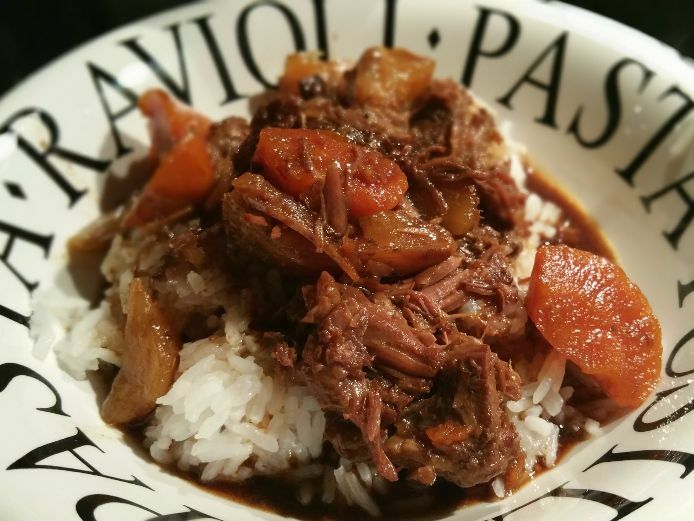 The actual Instant Pot meat/stew program was ready in thirty minutes! More information on the Instant Pot and Instant Pot FAQ links. Finished oxtail bones only – 1½ hours. Optional: added vegetables and used the manual slow cook program with adjusted time. Or use the Warm keep function additionally, set the time preference. Stovetop and slow cooker actual time would definitely between 4-6 hours or more depending on the cut size and weight including the preparation time before until the end of cooking time. If I had doubled or tripled the quantity in the Instant Pot, the cooking meat/stew program still be consistent ready in 30 minutes. 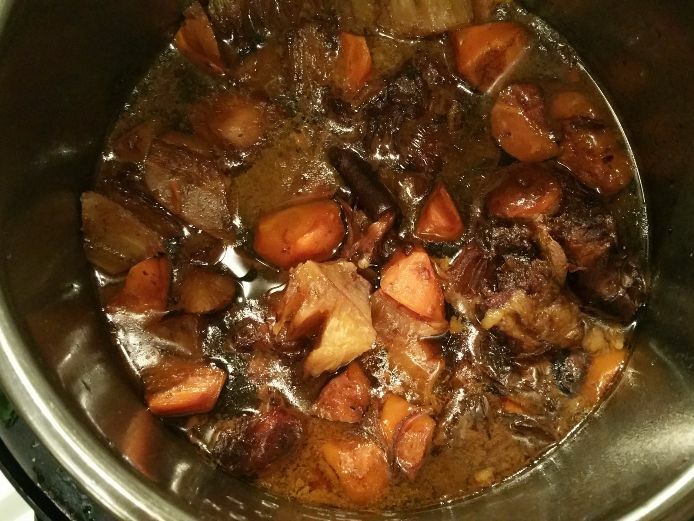 Shared my Instant Pot awe-struck moment of braised oxtail with meat falling off the bone while retaining the shape of vegetables. The Instant Pot microprocessor controlled programs work like magic. 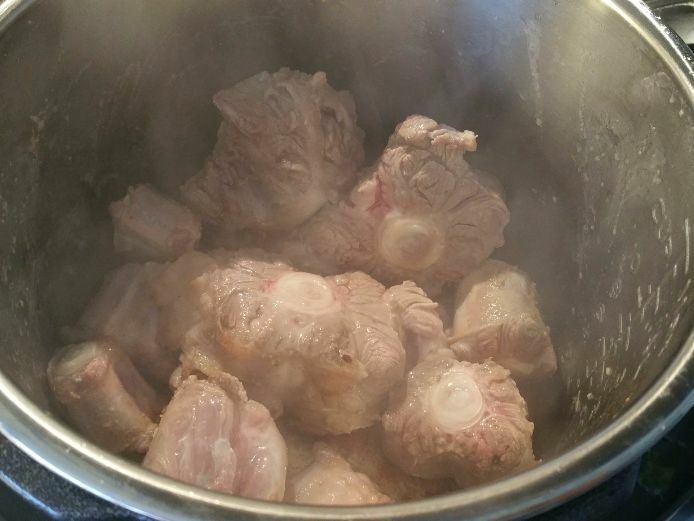 I posted a photo of my finished Chinese style braised oxtail bones on FB Instant Pot® Community group and received responses on how to make with a full recipe to share. Here’s a quick image overview. 1. Pushed the Sauté button, added vegetable oil as soon as it heated up I added all the oxtail bones into the pot for 5-7 minutes. When it’s browned well the meat releases easily from the bottom. 2. Stir meat around browning all sides, While turning everything around add the spices; cinnamon and star anise. As soon as they release aroma, add the ginger first than garlic. Keep stirring the pot to mix and pan-fry at the same time. With all the brown bits sticking pour in the Chinese wine and scrape the bottom loose. Followed by all other ingredients and close the lid. Cancel the sauté program and push the Meat/Stew button to start braising the oxtail bones. 3. After 30 minutes the beep sounded waited for the pressure to come down, the released pressured air carried a hint of the wonderful aroma. When I opened the lid this is what I saw, tender, moist oxtail meat, and vegetables in a flavoursome gravy with an intense fragrance floating upwards from the pan. Pleased as punch with my dish and my new kitchen gadget. 4. Transferred my braised oxtail dish into a normal pan, time to dish up the plates. Life is good. Serve in a bowl with rice or noodles on the side or as a topping making it a one-dish meal. Not shown in the image (too fast gobbling it up), for a beautiful presentation you may choose to garnish it with sprigs of coriander, thinly sliced onion rings, diagonally slices of chilli pepper or a mix of altogether scattered on top. Click here for the Chinese style braised Oxtail bones recipe. Please read my disclaimer and disclosure on affiliated links and copyright notice for links and information in this post. Chinese style braised oxtail bones are served as a topping on rice or served separately in a wide bowl. Vegetables as carrots and cassava are added making this dish a hearty and flavoursome nutritious dish. Paleo fans will enjoy its warming earthiness as much without any gluten ingredients. Interchanging between a variety of bean sauces (Chinese fermented soybean sauces), chilli paste and spices will allow you to play with an aroma to your own liking. Or be adventurous and choose to cook from other south-east Asian cuisines enjoying the different flavour, texture with salivating fragrances. Serve in a bowl by itself with rice or noodles on the side, or topped above as a one-dish meal for lunch or dinner. As a main dish, if preparing a menu for more persons, I would suggest adding a vegetable- and doufu dish with a light soup to complement each other. The Chinese style braised oxtail bones will be the focus for your guests at the table. 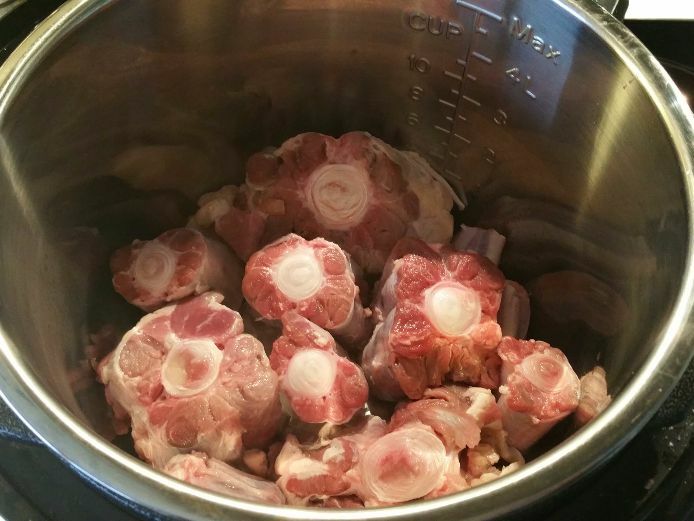 For the recipe scroll here below, click here for Chinese braised oxtail in Instant Pot information and photo images. I received engaging comments with the questions, how much liquid to add. Followed by the difference between braising and stews. In answer to my readers, I am updating the post with the replied information on the method of cooking techniques used for tougher cuts of meat. To start with the liquid in any recipe, it focuses on the right volume to add, water, stock or broth. Next, the cut size of the meat (small cubes) and cutting against the grain means cutting crosswise through the long muscle fibres in the meat. Breaking them up makes meat more tender. Often used cuts are the less tender and gelatinous parts of meat for slow cooking as well as the use of accompanying vegetables in the dish. In order to fuse all the ingredients together to melt into a tender and flavoursome dish, is by breaking down the connective tissue as tendons (collagen) just simmering it slowly using the right low temperature. Braising and stewing cooking technique are combination cooking methods using the hob and/or oven. Braising is cooking meat on a bed of vegetables in a small amount of liquid, utilising steam and stewing in its cooking process. At the end of the cooking process, the meat often falls off the bone and the concentrated gravy is clinging to the pieces of meat. Stewing is a slow cook method, where the food is cut into smaller pieces and covered in liquid using gentle heat for a long time. Here the meat is fork tender and the liquid is reduced covering the meat pieces in an aromatic thick sauce. Cooking with high pressure is perfect it doesn’t require a whole lot of liquid, making it perfect for braised dishes in my Instant Pot DUO 7-1 I use or Lux 6-1 (version without yoghurt option). In comparison with my stove high-pressure cooker, where you have to manually set the timer and keep an eye on it still. The IP has automated meat/stew 30 minutes program you just press and walk away, at the end of time cancel the keep warm function so the natural pressure release can come down a bit faster (approx. 30-45 min.). For a braised result, I submerge the meat by adding water or stock just barely covering it exposing some of the bones and meat. If you would opt for only (e.g. 50%) using half of water or stock to add, be aware that the gravy will reduce significantly as well. Tip: Keep in mind if this dish is completely cooled the gravy of the bones will be very gelatinous (jiggly as jelly). Meat jelly is another Chinese delicacy served eating it cold as homecooked food and can be creatively used in appetisers or bun fillings for example. If I like to make a stew instead, I will submerge the ingredients covering it to ½-1 inch (1 ½ – 3 cm) above with liquid or more if it calls for a soupy consistency. Tea leaves: Green tea or Jasmine tea is very common, but Pu Erh tea has an earthy smokiness which is very pleasant with an added bonus it really cuts the fat down in your body. For the beer fans: You will enjoy this dish with a light beer, a darker beer, even more, tasteful. In The Netherlands seasonal draft beer or bottled bock beer would be nice to pair along, it has richer, sweeter lager with warm toasty undertones and minimal bitterness. More information on Beleef bockbier 2015, with an overview of 125 different bock beers in The Netherlands. Besides Guinness Stout beer or a Kilkenny, share yours. As for wine lovers: A red Bordeaux is an easy choice, but for the adventurous wine sleuth, an Australian Shiraz-Viognier Barossa 2006 is a discovery I can recommend. My all time favourite would be the Chilean Tarapacca Carmenere, rich in berry fruits and spices to pair with my bowl of Chinese style braised oxtail bones. You will not believe it, but I made my acquaintance and fell in love with Tarapacca in Taipei. Of course, there are far more than one grape or bottle, the more reason to cook and pair more meals. 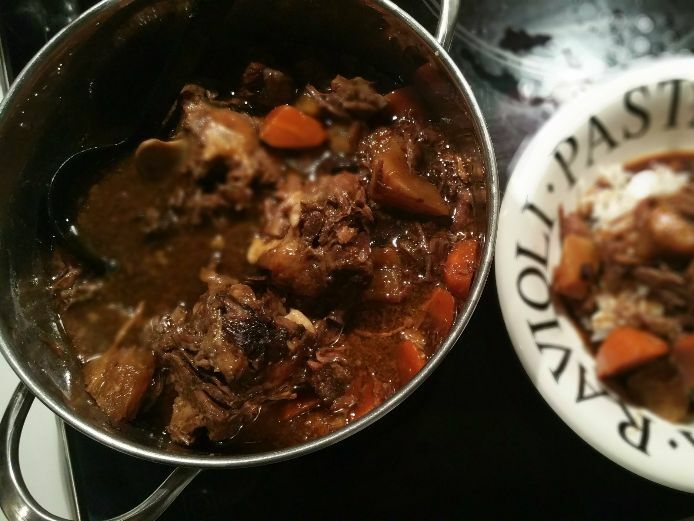 If you have made the braised Oxtail bones, share your dinner send me a photo.